(CNS): The jury heard that the former premier handed over at least one, if not more, blank cheque to his office staff in 2010 against whatever personal debts he owed on his government credit card. As the crown continued to call civil service witnesses Friday in the case against McKeeva Bush for abusing that card, the issue of how Bush paid back his personal use was addressed. 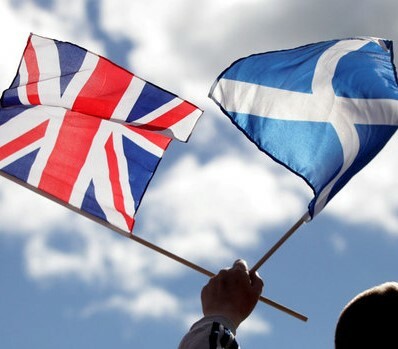 The court heard that as a result of budget pressures and the requirement in 2010 that government actually met its statutory obligation to submit its accounts on time, the system of sending memos with credit card statements to the premier to mark his personal expenditure fell apart. When Wendy Manzanares, a government accountant, took to the witness stand, she explained that she had been forced to do a reconciliation of the premier’s credit card accounts in October of 2010 at home and out of office hours because the unit was so stretched. She said she had gone back to the date of issue of the card, which was in July 2009, because the management system had fallen so far behind. This was down to a combination of resource and staff shortages, budget preparations and the need toget the financial statements to the auditor general by the statutory deadline, the accountant explained. Bush had been sent memos with regularity until around March or April 2010, the witness recalled, but she admitted that those stopped when the unit became under increasing pressure to complete the priority work of the budget and the government accounts. During her evidence, as she was questioned by both crown prosecutor Duncan Penny QC and defence attorney Geoffrey Cox QC on the fourth day of live evidence in the Bush trial, Manzanares explained that she had created a spread sheet to ensure funds were recovered. This document was designed to reconcile Bush’s credit card account from the issue date and she used the original statements for the basis of the information as well as the government computer system, which indicated what payments Bush had already made for personal use. Focusing on cash withdrawals, she explained that past evidence had suggested these were more often than not personal payments and she made a list of those against the payments the premier had previously made to government and was left with an outstanding debt of about $10,900. When this was completed she forwarded it all, along with the statements, to his personal assistant in order for the premier to acknowledge if her assumptions about personal use were accurate and to then address the outstanding balance. In her evidence on Thursday, Bush’s former PA said she had no recollection of receiving the reconciliation, despite Manzanares' account that, as well as the email, hard copies were delivered to the premier’s office. Manzanaresstated that she had followed up on those reconciliation documents, but as time went on, given what were described as more pressures in the office along with more staffing problems, the issue was forgotten. However, in November 2012, two and a half years later, when the police began their investigation, the issue was raised again. It was at that time that Bush is understood to have paid the outstanding amount back. Bush was said by his attorney to have explained to the finance unit that he was unaware of the outstanding sums and claimed to have never seen Manzanares' original reconciliation of his account that detailed the debt. It appears that Bush believed by handing over the blank cheques he had dealt with the personal debts. Manzanares also confirmed that until the memo system broke down, where statements were sent to the premier every month asking him to mark the personal use and pay it back, he had made good his outstanding personal use promptly. The court heard that if he was away, especially on back-to-back trips and did not see the statements, he was known to have left blank cheques in those circumstances as well to cover whatever his outstanding balances were, trusting staff to get the calculations right and then make the payments. The government accountant said she was aware that Bush had left personal cheques for employees in the finance unit to fill in against outstanding balances, though she had never filled in the cheques herself. The case against Bush includes 11 counts under the common and anti-corruption laws in connection with what the crown says is an abuse of office. The prosecution claims he used his government credit cards to draw cash advances in casinos to gamble on slot machines between July 2009 and April 2010, breaching the public trust by using his position to get a free line of credit for his gambling. Bush has denied all of the charges and has persistently claimed he is the victim of a political witch-hunt at the hands of the FCO. The court adjourned at 3:30pm Friday until Tuesday morning at 10am, as a result of further closed door arguments expected to take place Monday between the defence team and prosecutors. The second beneficiary this year is John Gray High School’s “Helping Hands Program”, through which JGHS provides—among other things—hot meals, uniforms and school supplies for any grade 7 to 11 child, who needs this assistance. So far, sponsors Cayman National, ROMA United Sports Club, Maedac Supply Company through their WATA brand and Grand Old House, already confirmed their support. Event registration is still an affordable $15.00 for adults, $10.00 for students under sixteen and is ongoing at radiocayman.gov.ky and caymanactive.com/breeze. All participants receive an event t-shirt & goodie bag. 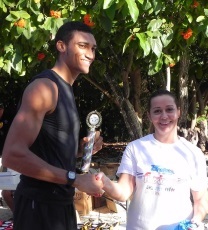 Trophies go to the overall male & female finishers in the run, along with medals & prizes to the top competitors in each age category for both the run & walk, with random prizes also up for grabs. (CNS): The RCIPS have arrested a 30-year-old man from West Bay in connection with the fatal shooting of Solomon Webster on Sunday 7 September. A police spokesperson said Friday that a police operation involving firearms officers, Drugs and Serious Crime Task Force, Operations Support Unit and Criminal Investigation Department on Wednesday 17 September in the West Bay area, resulted in the local man’s arrest on suspicion of accessory after the fact to the murder or manslaughter of the 24-year-old Special Olympian gunned down in Daisy Lane. Webster died after he received a gunshot wound to his groin area. Police have already charged Jose Sanchez (27) with the killing and possession of an unlicensed firearm. The RCIPS charged 60-year-old David Lauer earlier this month also with accessory after the fact to the murder or manslaughter of Webster. (CNS): The Cayman Islands National Gallery’s third annual art exhibition and auction in support of its education programmes and collections fund opened this week and the public is encourage to go along over the next two weeks and bid on work by some of Cayman’s leading local artists. The exhibition is open until Tuesday, 30 September and will culminate in an invite-only reception and auction on 1 October 2014. The annual Big Art Auction distributes 50% of funds to the artist and 50% to the gallery to ensure the project remains sustainable and benefits both parties. She explained that art on display is surrounded by contextual and interpretive materials and storytelling, arousing interest and curiosity by bringing Caymanian history alive. “NGCI programmes go far beyond teaching art skills to include cognitive development, cross curricular learning opportunities (maths, literacy, social studies, and history), teambuilding, confidence growth and so on,” added Urquhart. The Gallery has also acquired a lithograph from Francisco Goya’s famous Los Caprichos series and which was recently exhibited in the National Gallery Metamorphosis exhibition which will also be auctioned. Anyone interested in purchasing work on display at the Big Art Auction 3 or supporting the National Gallery’s Collections Fund please speak to an NGCI staff member or call the National Galley at (345) 945 8111. (CNS): One of Cayman’s football administrators has been appointed as the Technical Development Officer for the CONCACAF region. 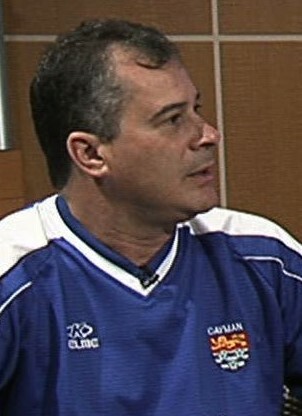 Marcos Tinoco, CIFA’s Acting Technical Director and Administrator who also served as the national coach from 2003 to 2007 and from 2010 to 2014 in several official capacities will, in his new job, be working presenting best practices in technical development and managing FIFA’s player, coaching and development initiatives in the region. “I am happy to serve the region and continue to give back to the sport,” Tinoco said. Tinoco is joined by Former Trinidad and Tobago Technical Director Anton Corneal and FIFA Consultant Rodrigo Kenton on the FIFA Development Office in the CONCACAF region. CIFA First Vice President Bruce Blake described Tinoco as a trusted and valuable member of CIFA’s team. “His contribution to player development and football administration in the Cayman Islands cannot be measured and is greatly appreciated. We look forward to receiving his advice and guidance in his new role,” added Blake. (CNS): With many local job seekers still experiencing difficulties looking for work, CNS readers have identified more advertisements that raise serious questions about employers’ compliance with the labour and immigration laws. Several recent ads have included requests for specific nationalities, a post for a maintenance person with their own car, salaries that are completely disproportionate to the required qualifications and pay that in many cases would fall far below the minimum wage of $5 per hour, if it we had one. Despite government’s promise to remove barriers to work for locals, many job ads are clearly still being tailored to fit imported cheap labour. 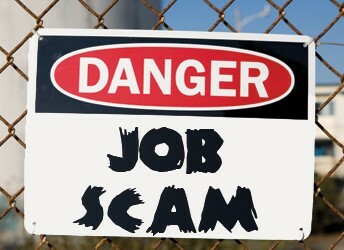 Concerns are not just from job hunters. One of government’s own backbenchers told CNS he was very disappointed to see some employers continue to show complete disregard for the law and the people of these islands. Suckoo stated that in its efforts not to be too heavy handed, government has given employers time to adjust to the new administration and to understand that it will not turn a blind eye to these immoral and illegal practices. But, he said, it was now time to demonstrate that the government is serious about tackling discrimination against Caymanians. “The practice of drafting ads that are completely unreasonable in what they are asking for, especially when one looks at the salaries offered in most cases, is not only unethical it is illegal and I want to remind employers that they could receive fines as high as $20,000 from the immigration department for these offenses,” he added. Suckoo said he will be discussing some of the latest infractions regarding recruitment practices when the political arm of government next meets and will ask Cabinet to direct the immigration department, via the chief immigration officer, to take strong steps to ensure that this stops immediately. The rookie Bodden Town MLA has already spent a considerable amount of his early political career in the Legislative Assembly debating this issue and has made it his business to address the marginalisation of local workers while in office. He recently described the struggles of the Caymanian middle class during a debate in which he seconded a successful motion by Winston Connolly to have some of the cash collected by immigration from work permits ring-fenced for training Caymanians. 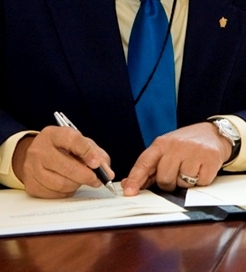 The examples of tailoring or simple exploitation are still common and despite a commitment to enforcement by the PPM government there are still many obvious infractions. A recent advertisement for a “Filipino Nannie” was a clear breach of the immigration law but other infractions are far more subtle. 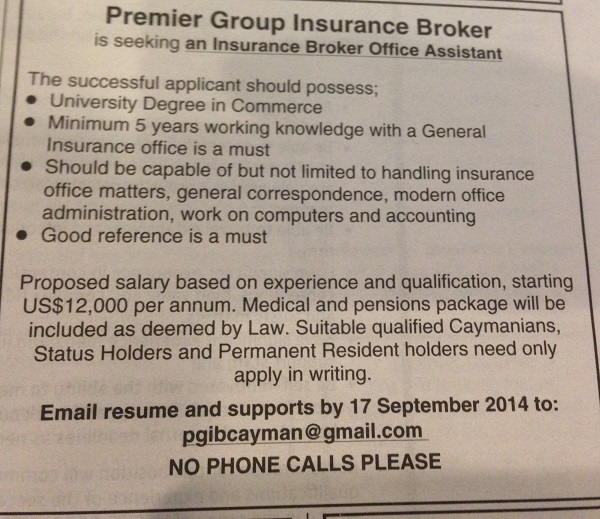 A recent ad for an office administrator at an insurance broker asking for someone with a degree in commerce, more than five years insurance office experience including accounting with a salary of just $800pcm is more illustrative of the posts being tailored to existing permit holders and to deter applications from local job seekers. Local activist Sandra Catron, who has been monitoring some of the practices of local employers, told CNS that she remained awestruck at these advertisements. “Cleary the job requirements and salary offered are not in sync with each other and that makes any reasonable person question the very authenticity of the recruitment process. 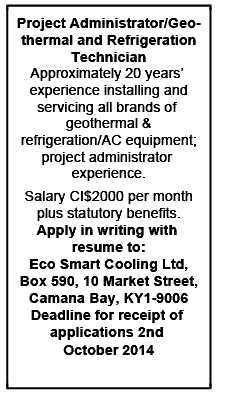 To think that an educated person with 5 years’ experience could and would actually work for less than CI $1000 per month is incorrigible,” she said this week as another array of ads were published with salaries that were completely below what would be considered reasonable. Catron says she wants to know if government is going to make employers accountable. “As a society we cannot sit back and allow these employment injustices to occur without addressing them. There is a trickle down affect where abuse of anyone eventually impacts us all. So if for no other reason than self-preservation, we should all be concerned to raise the bar," she added. With the advertisement for the office post attracting more than a 100 comments on social media it is clear that the community is not only concerned that employers carry on doing this but that they are getting away with it as the authorities are failing to stop it or hold anyone accountable. Recent samples of recruitment ads that raised eyebrows. 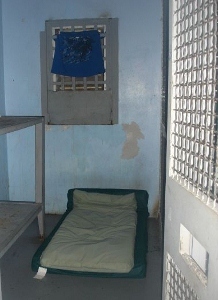 (CNS): Another independent report has criticised the conditions, as well as the procedures, at George Town Police station’s custody suites. An independent report conducted by the Bermuda Police service surrounding the arrest and suicide of PC Raphael Williams concluded that the standards at the George Town Police station fall far short, not just because of the state of the cells but because officers are not following proper procedure. The report found inconsistent records, illegible notes, missing information and confusion over the management of medicines for suspects in custody. The visiting police service also noted the serious liability presented to the RCIPS by the state of the cells. A redacted verision of what had been a secret report was released on Thursday by the governor’s office, following the conclusion of the coroner’s inquest on Friday, when the jury returned a suicide verdict. The Bermuda officers were asked to undertake the independent investigation by the police commissioner following the death of PC Williams and a complaint that was filed about his treatment. The author, Robert Cardwell, reviewed the circumstances surrounding William’s arrest, the evidence against him, his time in custody, the treatment he received and the circumstances of his death and largely rejected the allegations that had been made about the chain of events. The report concluded that the investigation had been above board but Cardwell and the two offices from Bermuda who assisted him raised several concerns about the custody system and suites. Not for the first time the custody system was described as poor and echoed complaints heard on numerous occasions in the local courts when what should be important records kept by police at the point of arrest of suspects have been found to be incomplete, inadequate and illegible. The Bermuda police also found that the cells still being used by the RCIPS at the George Town lock-up, as they await the completion of the new custody suite, were in an appalling state. The visiting officers also noted the potential dangers for self-harm to prisoners as a result of the cell layout, and when they toured the facility the CCTVs were not working, as had been the case when PC Williams had been detained in the cells overnight. The findings of the Bermuda Police reflect those of the UK’s HMP Inspectorate when they condemned the custody suites at GTPS in an extensive review of the prison and police detention facilities in February 2013 more than 18 months ago.